Accommodation Milton Keynes takes on many different types. They all mean you have a choice when it comes to booking a place to stay while visiting this vibrant City. Serviced apartments are particularly well appointed if you are travelling with friends or family as they are spacious, have a well equipped kitchen and are a cost effective option based on the self-catering and paying per apartment rather than per person. Ignite the Christmas spirit with a festive weekend getaway to the vibrant city of Milton Keynes and stay in a serviced apartment in Milton Keynes. Milton Keynes is a city filled with many social, sporting and cultural activities throughout the year including the festivities of the Christmas Season. With all that Milton Keynes has to offer, why not make the most of your visit and stay over to experience this vibrant city by day and by night! The types of accommodation available include self-catering or serviced apartments, Bed & Breakfasts and hotels. Christmas in Milton Keynes is traditionally filled with a magical spirit of childhood wonders. On the third Friday of November the shopping mall, thecentre:mk located in the heart of the City Centre, opens its annual Christmas show, “Christmas Adventure”. The festive bonanza features the ever-popular Santa’s Grotto, an indoor Ferris wheel, a double decker carousel and a variety of Christmas scenes designed to celebrate the yuletide. What is Christmas without a Pantomime? Milton Keynes Theatre is one of the region’s leading live entertainment venues, showcasing the best West End and touring productions from across the UK each and every year. Each year the MK Theatre hosts a spectacular pantomime with the lead roles played by television legends. Make sure you join them on their fun-filled story adventures. This is a great reason to visit Milton Keynes Theatre over the Festive Season. The Theatre District, in the heart of Milton Keynes city centre is well known as the place to eat, drink and have fun. It offers a fantastic and varied selection of restaurants, al fresco dining, and a vibrant party atmosphere. So, if this is all tempting enough to make a week-end of your visit to the theatre, there are a number of one, two or three bed-room serviced apartments Milton Keynes for you to book-in to. A well-known corporate Christmas event venue is the National Bowl located in the city of Milton Keynes. It is a massive outdoor entertainment venue, which can hold 65,000 people. The National Bowl has seen the appearance of Queen, David Bowie, Michael Jackson, Metallica, The Prodigy, Bon Jovi and in 2006 Robbie Williams staged five sell out concerts. Each year it hosts a themed Christmas Party in a large marquee decorated out accordingly. For those who plan to party into the early hours, you may want to book into a serviced apartment in Milton Keynes all of which are within a short taxi journey from the party venue. They are spacious and accommodate up to six people with a fully equipped kitchen so you can self cater. Contact us now to book your Festive weekend getaway. 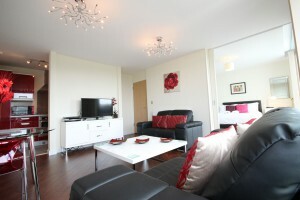 Cotels Serviced Apartments are a great place to stay for a weekend get-away. Accommodation Milton Keynes of this type are situated in the City Centre close enough to all the many activities and entertainment facilities offered at Christmas as well as many other themed events throughout the year.